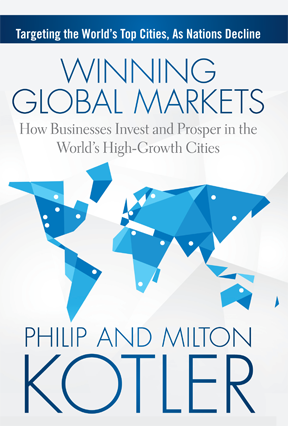 “I think that companies would benefit greatly if their senior management would read and discuss the eight ways to achieve growth in this difficult world economy. They would recognize pathways to growth that they have overlooked.” –Ram Charan, business consultant and author of Execution: The Discipline of Getting Things Done and other best-selling business books. “Market You Way to Growth goes way beyond marketing. It provides a fantastic framework for strategic leadership!”–Marshall Goldsmith – author of New York Times bestsellers, MOJO and What Got You Here Won’t Get You There and #1 executive coach. “In this period of slow growth, this book is bound to stimulate new thoughts on strategy.”–Wen Bo He, President, China Bao Steel Corporation. 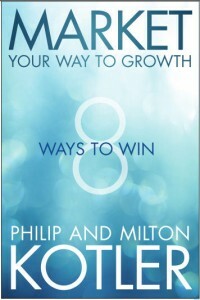 “Constant self-renewal is one of the essential traits for any business leader, and is an important theme in the Kotlers’ book. 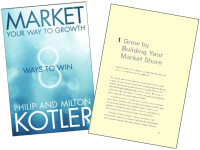 Their wisdom, keen powers of observation, rich experience, and common sense will surely make this an important and practical business book.”–Robin Li, Co-Founder, Chairman and CEO of Baidu, Inc.
“The eight pathways are a great place for a leadership team to start ideating about stepping up growth in what is likely a low-growth environment for the next decade.”–Peter Volanakis, Former President and COO, Corning, Inc.